SCRAP QUILT SECRETS is back in the shop! I'm so excited to have it available in print once again. The first printing sold out months ago and I've been anxiously awaiting these. 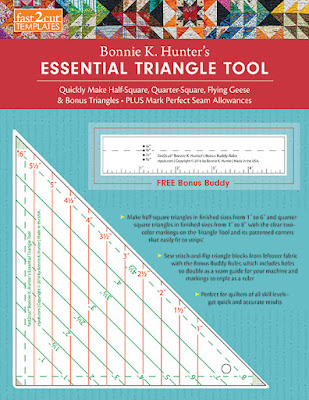 Also in stock are the the Bonnie Hunter Triangle Tools that are perfect for making half square triangles and flying geese units. This is the ruler used for several of the quilts in my new book. And it gets even better! If you spend $49 or more, there is free shipping in the US. That's right, you can grab both books and get free shipping! Or better yet, grab both books and a ruler and get free shipping and have a super scrappy happy mail day!! 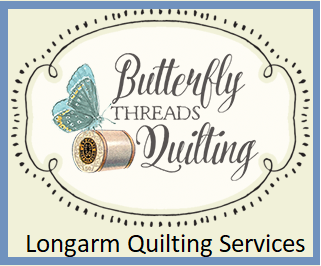 Thanks so much for your patience, and I do hope you will enjoy this new shipping offer and treat yourself to some inspiration, good reading and lots of quilting fun. I've just finished 3 quilts. Two were huge with digital edge to edge designs. One was small but custom quilted with rulers and free motion. So some fun variety to help hone my skills and keep me happy. I have a super quick turn around because I get stressed having things 'hanging over my head' so if you want to get a quote or send me a quilt for quilting, simply go here. Thank you!! While it rarely happens, sometimes pattern files need to be fixed. While I was at the print shop earlier this week, one of my patterns was not printing out properly. The diagrams were showing up so light that I couldn't use them. So I called my sweet graphics person who promptly diagnosed the problem and had it fixed in a flash, and then I was back to printing gorgeous patterns again. If you were one of the folks who missed getting a copy of Piney Grove it's now available in the shop! Or just pop me an email and I'll take care of you. Because I've been sewing in real time along with the groups and friends that are doing my Sew Your Stash Along I am finally sewing the next (or bonus) border on my quilt. I need mine to be king size and it's finally getting there! Whew! 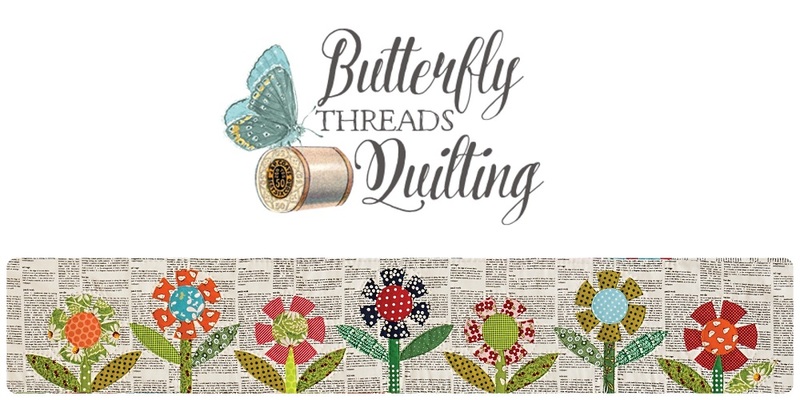 Did you know that there are almost a dozen guilds across the US and Canada that are sewing along with us? Some of them are doing it as a mystery, so SHHHH. I've several patterns at the graphics person right now getting their diagrams and layouts perfected. 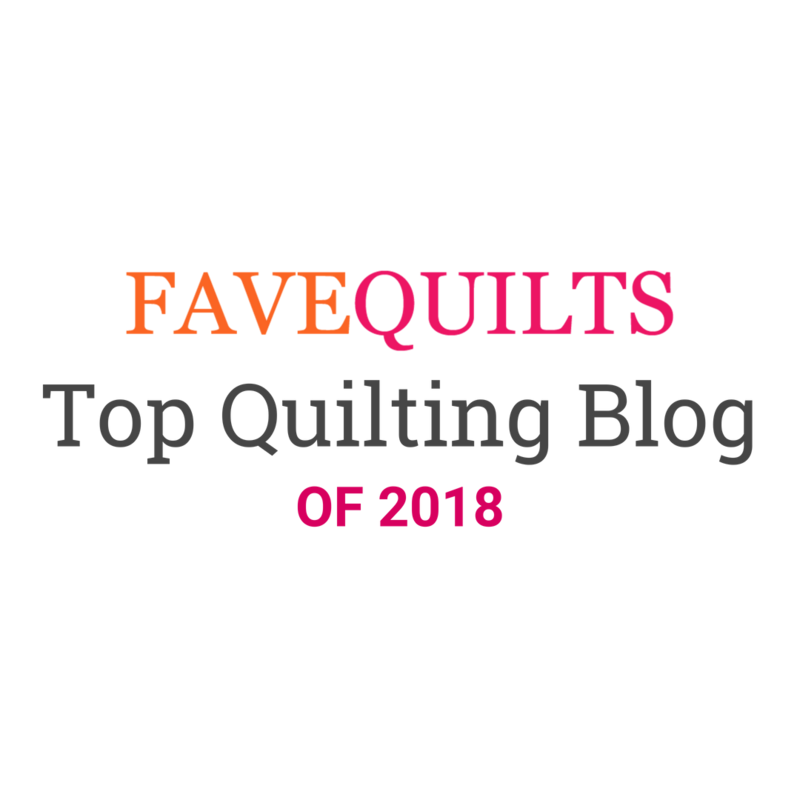 I've made a couple of the quilts and one is still in progress, but all that means is that you will have some new patterns to choose from very soon. This is my favorite part of the job I think, sewing and creating and then releasing the fun into the world! New patterns mean that I need to get in touch with my distributor about getting them into shops across the country. I currently have Checkers distributing my patterns, but am considering going with some additional sources. This takes time, research, and making new contacts, etc. This typically gets pushed to the back burner as it is not really all that fun. I've been busy booking air travel and planning road trips for my upcoming teaching events. I've got a system for this that works pretty well. When I travel by air, I need to have my books shipped ahead to meet me there. Unfortunately, shipments that were meant to go to other locations ended up at my house. Sigh. One more thing to take care of and it's an expensive error. I've been emailing and chatting with folks who already have signed contracts for teaching events in the next couple of years, and I'm always receiving new contracts for new events and sorting out the details. I have a few open dates for teaching this fall, and I'm am quickly filling my 2020 calendar. Please go here to see if I'm available for your group. You can get all my teaching information here. I would love to visit your guild or shop or group! 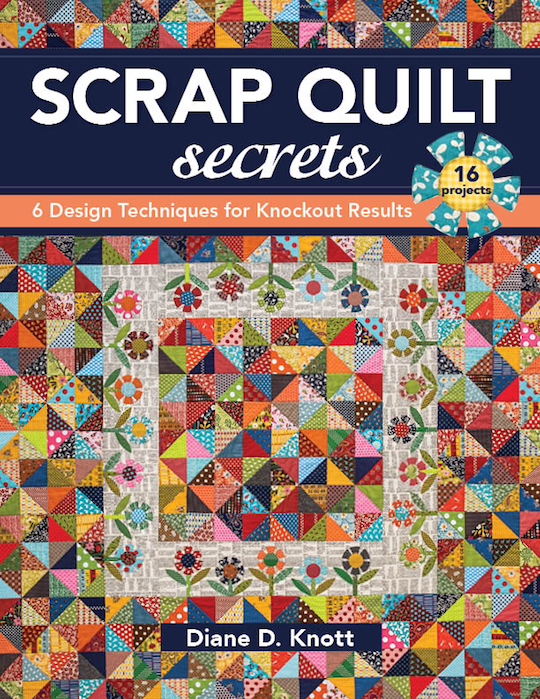 In the publishing world, it takes a year for a book to be released after all the quilts have been made. So I've got to decide which direction I want to go for the next book and who I want to publish it. I know it seems crazy to think about this because I've just released my second book a few months ago, but time is ticking and decisions need to be made. I have several ideas, and I want them all to happen eventually, I just need to decide what should be next and then get going on it. I'm considering self publishing and an international publisher. So the work load will be significant, but exciting and challenging. What to do, what to do? Congratulations for making it all the way to the end! I'm impressed that you are still here. And seriously, from the bottom of my heart, thank you for being a friend, for supporting my adventures and for going along on this fun fabric odyssey with me. Quilting is so much more fun with friends. Thanks for making this blog and what I do possible with your words of encouragement and enthusiastic support. I am sincerely grateful to have a job that I love! My husband was in the back yard and walked to the back fence (it borders another neighborhood) and was speaking with the woman who lives in the house behind us. They have a large white dog who likes to sit near the fence and watch our three dogs when ours are outside in our yard. Sometimes Boomer and the neighbor dog will even run along the fence with each other, like they are playing. As my husband and the woman were chatting, Boomer jumped up next to the fence and put his paws on top of the top rail. It's a 4-5 foot fence, so he can't possibly jump it but he can get his paws up on it. The neighbor dog jumped toward the fence and bit Boomer on is right front leg just above his paw. I was inside the house at the time and heard the dog yelp. It scared me because I've never heard any of our dogs make a noise that loud. It all happened in a split second, and Bill checked Boomer but he seemed fine. Bill was focused on Boomer's nose because he thought that's where he had been contacted. They came in the house and I asked what happened. Boomer seemed fine but as soon as he laid down, I saw his leg. The gash wasn't very long but it was DEEP. I could see the bone when he licked it and the skin pulled away. Immediately, we called the vet and said we were coming in for an emergency visit. The vet saw the wound and said he needed to be sedated for sewing the stitches and inspecting the wound. I was so upset at this point I felt like I would be ill.
We left Boomer at the vet for his surgery and drove to the other neighborhood to speak to the owners. They weren't home and we had no way to leave a note, so we drove back home. A few hours later we were able to pick up Boomer and bring him home. Boomer was super woozy for the entire evening and his siblings were very sweet and gentle with him. We started him on his pain meds and antibiotics. He loves taking his pills when we tuck them into hot dog pieces. He's such a good boy. Later that evening we saw the woman in her yard again so I sent Bill out to speak with her. I knew I couldn't be kind because I was still too upset and Bill is good at handling tense situations. He told her about the bite, the vet visit, the surgery, etc. She suggested that maybe he just got cut on the fence. Even though she had been standing there and saw the whole thing!! My husband let her know that it was definitely a dog bite. She said she was 'sorry' but she never offered to help pay for the vet bill even when my husband told her about the cost of the surgery. My heart is racing just writing this story out, I'm still so upset. My poor Boomer has 10 stitches in his leg and a big bandage covering his wound. He's being so good about not messing with the bandage, so no cone needed, thankfully. He's taking his pills like a champ and he's being as needy and clingy as ever. I'm trying to keep him calm, but he tends to get excited a lot. He's getting lots of extra snuggles for sure! He goes back to have his bandages changed on Friday and just to make sure there are no issues with the healing process. I have no idea why this happened and we have no plans to pursue anything further with the neighbor (though if the situation were reversed, we totally would have handled it differently!) We are just focusing on loving our fur babies and making sure Boomer is as good as new as quickly as possible. I've launched a new approach to my health and you can read the previous posts here, here, here and here. And I've realized we are overdue for an update. I have several reasons for sharing this publicly. One big reason is that it makes me accountable to you and to myself! Also, if it inspires anyone out there to think a bit more on their personal choices that's a bonus as well. Quilt world demographics tell me that most of my readers are women, and most of them are relatively near the same stage in life as I am (let's loosely define that as middle age, okay?) At this point in life, hormones and physical changes are not always working in our favor, if ever, am I right? While I rarely gave much thought to my health the first 40 years of my life, it was because I was active and never struggled to maintain a healthy weight. I enjoyed healthy foods. Then I had some issues that required surgery, medication, etc. And ever so slowly, I noticed extra pounds adding up, energy levels going down, and overall wellness just wasn't a given anymore. So I decided to make some changes in order to regain my health and feelings of wellness. So how am I doing since our last check in? I've not been tracking my eating with the My Fitness Pal App as well as I should have. With all the travel I've been doing it's really hard. I am getting better at recording everything when I am home and I think that helps me be more mindful of what my food choices contain. So that's good. While I haven't lost any real weight in the last month, I am still down about 20 lbs from where I started and that great! It's the rainy season in Georgia so I haven't been hiking or walking at all. I did get TONS of steps in when we were on vacation in California! Also, I've joined a new Club Pilates that just opened not too far from my house. I've been going for one month and I can tell a huge difference already. Not in weight loss, but in muscle tone, balance and strength. Other than being REALLY SORE most of the time I'm not in class, I like it very much. I plan to continue to add in more walking if it ever stops raining. Speaking of rain, I've been using this daylight lamp for the past few months and I think it really helps. Travel has been my biggest challenge. It's hard to get my daily steps in when I'm driving long distances or sitting on airplanes. Some days are much better than others. My travel schedule is really full through June, so I just need to continue to be mindful of doing what I can on the days that I can. Computer time continues to be a challenge. I spend way more time at the computer than I want to but I'm trying to break it up with movement and activities. While I haven't managed to create much time for 'sewing for fun' which is one of my goals, I have been busy making plans and sketching ideas. So if I do get a chance to sew, I know what I want to work on! Continue to reduce sugar intake. Add more yoga and stretching to my exercise routine. Try setting a timer on computer time. Schedule 'sewing for fun' time. So these are some specific actions I can take even when my travel schedule threatens to overwhelm me. Let me encourage you to write down some small specific actions you can do for your health. We all have fabric stashes that we need to live long enough to enjoy! Making small steps toward better heath is much easier that being overwhelmed by the big picture, don't you agree? Enjoy every step, stretch, and stitch! Cut two sashing strips 1 1/2'' x 70 1/2''. Cut two sashing strips 1 1/2'' x 72 1/2''. 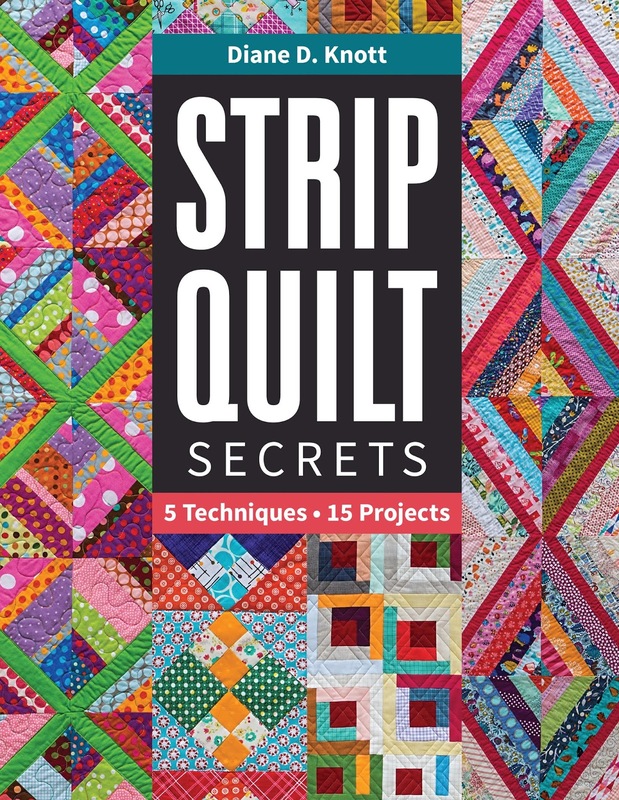 Sew the 70 1/2'' sashing strips to opposite sides of the quilt. Press toward the sashing strips. Sew the 72 1/2'' sashing strips to the remaining sides of the quilt. The quilt will now be 72 1/2'' square. Each block is made from two 4 patches and two HST. The blocks shown are made from one background fabric and one color (green) for the 4 patches and one color (red) for the HST. These blocks could be made scrappy or from two fabrics and a background. I didn't have enough of any red or green so I made several combinations of blocks using 3-4 reds and 3-4 greens. Cut one background strip 2'' x 8''. Cut one color strip 2'' x 8''. Sew these strips together lengthwise. Crosscut the strip set into 4 units 2'' wide. 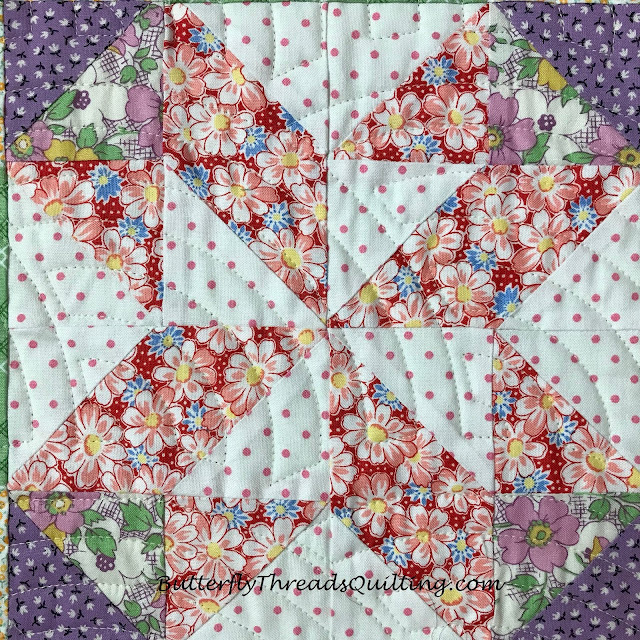 Sew these units into two 4 patch blocks. Cut one background strip 3 1/2'' x 5''. Cut one color strip 3 1/2'' x 5''. Layer these strips right sides together and cut two triangles pairs using the 45 degree ruler. Sew these triangles together along the long side. Press toward the darker fabric. Arrange the 4 patches and the triangles as shown in the diagram. Arrange the blocks as shown in the diagram. Sew two rows of 12 blocks and sew them to the top and bottom sides of the quilt. Sew two rows of 14 blocks and sew them to the left and right sides of the quilt. The quilt will now be 84 1/2'' x 84 1/2''. If you missed a step or would like to join us now, the previous steps are found below. Please be sure to download and print the steps now as they will only be active on the blog until further notice. At some point, they may be removed for publication. An announcement will be made before that happens. I would love to see photos of your quilts in any stage of progress, and I would love to see photos of the finished quilts (no matter how long it takes!) Remember, it's NOT a race, it's an adventure! Thank you for sewing along with me. I hope you've had as much fun as I have! To Spin A Star ... New Pattern Now Available! But then I got my Handi Quilter Amara! And it was the very first quilt top that I loaded onto my sweet new longarm. 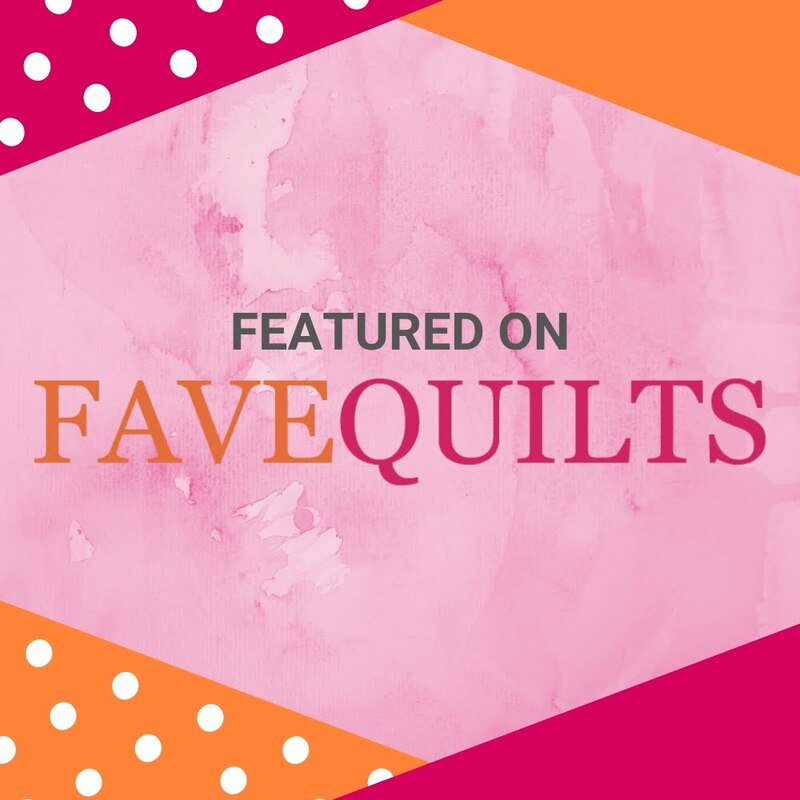 I chose the baptist fan pattern because I loved the traditional feel of the design with the soft vintage look of the fabrics. And those longarmers out there who are laughing right now -YES- this is one of the most tricky designs to line up and crop and get just right but I was too new to know what I didn't know! Luckily my sweet (and extremely patient) friend Shawn came over and held my hand and showed me how to make it work (without being judgy at all!) She showed me all of the ways I had made it more difficult than it needed to be. I am forever grateful to her and will never quilt a baptist fan without smiling and thinking of her kindness! Love you Shawn!! The pattern uses strips to make all of the units. 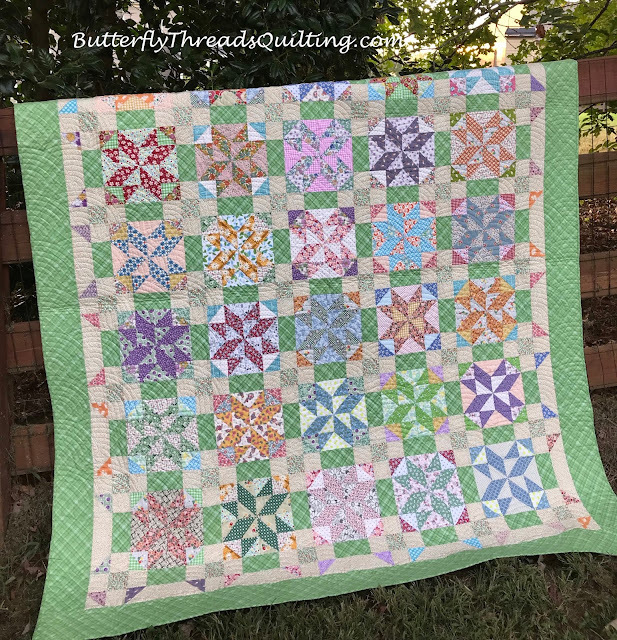 No oversize piecing and trimming here, life's too short for that craziness! The instructions include diagrams, photos and complete step by step instructions. You will need a 45 degree ruler such as the easy angle or the Triangle Tool which is available in my shop as well. The stars are surrounded by simple pieced sashing to create the secondary design. This quilt is perfect for using a fat quarter bundle, jelly roll OR simply dig into your scraps! If you would like to purchase the download version of the pattern from my shop it is being offered for a special introductory price of just $5 for a limited time. Print versions are also available at regular pattern prices. 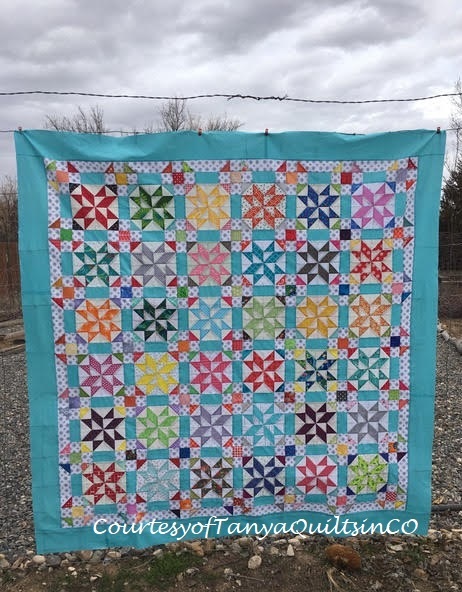 I hope you have lots of fun spinning these pretty little stars!